Published: . Filed Under: Surviving Kids, Uncategorized. Today I’m at The HerStories Project talking about my struggles and joys with working and writing from home. It’s a hard balance, one that it is in many ways unachievable. Balance is impossible, but sanity is. In our culture we often think that our stories are intensely individual, personal stories of coping and resilience, fulfillment, or dissatisfaction. And of course they are. But there’s also an element that many of us don’t emphasize enough when we write about family/work issues and how they impact our lives. When Lisa Belkin, the original writer of the 2003 “Opt Out Revolution” article, wrote yesterday about her observations 10 years after her piece, she described three lessons from these women who “opted out” and now want back in. First, don’t walk away completely. Find some connection to the professional world. Opting out isn’t just for women anymore. Men want balance and flexibility too. The workplace needs dramatic, deep change. Most women don’t have the privilege of working at a job with flexible scheduling. For many families, sick time, parental leave, personal time, health care insurance are all. Keeping this in mind — that there is also a “public” aspect to our personal lives — I do think it’s important to talk about both aspects (the personal and the political) of work/life balance. 1. First, I would remind work-at-moms again that the personal is the political. Don’t check out of citizenship; be politically engaged. We are in dire need of supportive institutions and policies for working families in this country. Even if you’re home alone all day, with no one to talk about the latest state congressional race or a voting referendum in your own, stay knowledgeable about local and national political conversations. Research candidates and vote for the ones that reflect your family’s values about supporting families. 2. Don’t neglect your relationships, especially your marriage. Since I started working at home, my time with friends and my husband away my son has decreased dramatically. It’s so easy as a work-at-home trap to fall into the trap that any “free” time should be spent on your work. But I’m starting to realize that relationships have to be cultivated or they don’t grow — just like professional success — and the calmness and recharging that come from talking and thinking about something other than your work or your children are priceless. 3. When you have an important work-at-home obligation — a conference call, a meeting, a deadline — always make a backup plan to your first child care option. I’ve had several important phone calls that became extremely frustrating because my son was home sick from preschool, and I had no Plan B. 4. Create a (flexible) schedule for yourself. Know when the best times for you are to work — do you work best at night? early morning? — and be realistic about how much you can accomplish during those blocks. Don’t set yourself up for failure and frustration by expecting to get too much done during short chunks of time. Keep track of your short-term (daily) and long-term (weekly and monthly) goals. And when you have those blocks of time, focus. Again, focus. This means turning off Facebook and your e-mail account if those things distract you. 6. Find a work space and set boundaries. For me, I like to work on the dining room table. I keep my notes, books, and computer on the dining room cabinet. No one is allowed to touch my stuff. Ever. For most people, I think finding a quiet space in your house — an office, a desk in a bedroom — works best. Be vigilant about protecting your space and your time when you’re working. 7. Finally, find times to “turn off.” Unplug. Unwind. In every sense of word. No Facebook, no Twitter, no phone, no e-mail, no texting. Find time, even it’s five minutes a day, to do something — anything, from yoga to a walk to cooking a meal — that doesn’t involve communication or social media. For parents who work at home, or do part of their work at home, what have I missed? What are your words of wisdom for stay-at-home moms? These are great ~ and the social studies teacher in me is shouting a huge AMEN! for #1 🙂 I guess this summer I have dipped my toes in the work-at-home world being a blogging-teacher-mommy, and these suggestions are so helpful. (I’ll really try to work on being okay with dust in the corner… I’ll try). Great post, as always. I would just add: during the day (or your preferred work time), use those “time scraps.” In grad school, if I had an odd 30-45 min. between lunch and a seminar, I’d say to myself “I can’t really accomplishing anything in that time,” and use that as an excuse so surf the web or take an extra long coffee break. Ever since I became a parent working mostly at home, I don’t let those in-between bits of time go to waste. Even 15-20 min. is enough to do a quick free-writing brainstorm, make an email inquiry, or look up someone’s contact info. While I miss writing at a more luxurious pace, having my evenings free of these little chores means I’m better able to do #2 on your list–I’m a better conversationalist (and overall companion) with my husband and friends. It’s so true. What I loved about graduate school was the luxury of time that I had. How I miss that luxurious pace too! The two hours to spend exploring a topic, even though I was pretty sure it wouldn’t go anywhere. The entire afternoon to explore the library stacks for books in your topic that you’ve never seen. Just like you, I was so used to thinking of half hour blocks as meaningless, just a scarp of time to read a website or make a snack. Feeling like I need to work all. the. time. is the hardest for me. I’m home, there’s my computer, why shouldn’t I be working? But then I realized that no job is paying me to be working THAT many hours in a day and I can have times when I unplug. Great tips! I found I needed to identify “my best time” and tried to really keep that time uninterrupted – not try to squeeze in little chores. I know… Recognizing that is key. My “best time” is morning. Weirdly, for writing, I’m 100% of a morning person. Anything that requires serious mental energy is for that chunk of time. I try not to do less mentally taxing tasks during those free times in the morning. This is so helpful, Jessica! You have really great ideas here, and I think these tips would resonate with many women, WAHM, part-time working moms, and even moms who are attempting to have some sort of focus, hobby, or outside interests! Great job! These are all fantastic tips. Thank you for the reminder of citizenship… it’s so critical. Also, I like to stay connected by doing volunteer work. It keeps me engaged and involved in my community. Thank you, Jennifer! I would LOVE to do volunteer work. Someday, right? I was impressed by how many of the women in the famous “opting out” cohort ended up gaining important career skills from their volunteering experiences. Jessica, this is great. As a woman who stayed at home and didn’t even think about work for 3 1/2 years, and has recently re-entered the workforce part-time, some of which is at home, I can relate to each point and can tell you right now that my biggest fail is number 4. Not so much the creating a flexible schedule – which I have – but defining what I will do during the time I want to dedicate to work. I have a hard time not getting distracted when I’m at home. I think “oh I’ll just reply to this blog comment or finish tweaking xyz, sharing, etc” and realize that 3 hours have gone by and that my son will be home soon, which means I can’t do ANYTHING (I realize this may change as he ages and matures but right now, I am not one of the moms who can be on Facebook when I am with my son – both for him and for me…mostly). Thanks so much for writing this. Also, I appreciate the advice of not beating myself up. I waste way too many precious minutes feeling like I did the whole afternoon wrong. Sigh. Kristi Campbell recently posted…Sharing duos and duets that I love. And what’s the difference between a duo and a duet, anyway? I think it is important to enlist the assistance of your family and hire help when necessary. A landscaper or maid every few weeks can make it possible to stay on top of routine tasks in the yard and around the home. As kids get older, they can help with these chores and earn a few extra dollars. Many work-at-home moms fall into the trap of trying to do it all themselves. 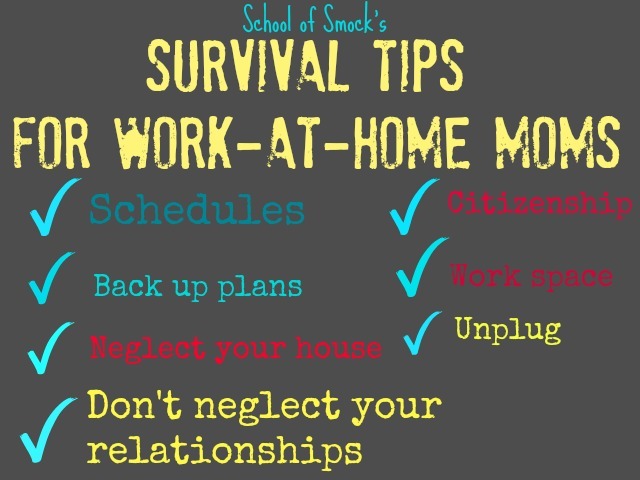 Great tips and the one I need the most help on is finding time to unplug!!! I’m also guilty of working myself over and above and at the expense of my sanity. I think many of us WAHMs try to do everything ourselves…in the end, it’s not healthy. It’s really hard to delegate when you’re the one who’s generally at home the most. And it’s hard to justify taking the time off to unplug. But I think you really do become more productive during your times “on”…. contains tons of helpful data, thanks for providing these statistics. Such great advice, if only I could follow it! Well the not becoming a full-time housekeeper part I have down pat!